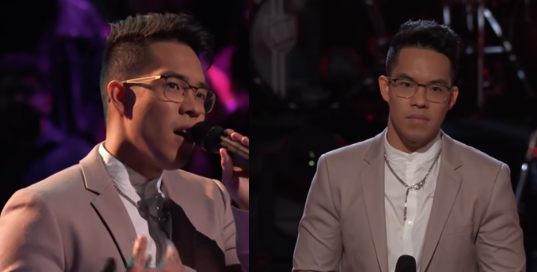 A Pinoy singer Jej Vinson advances to the next round of The Voice US. Jej faced contestant Beth Griffith-Manley during the Battle round of the 16th season of the American reality singing competition. The two performed their own rendition of the song "Jealous," by Labrinth. Jej and Beth are both members of coach Kelly Clarkson's team. Jonh Legend: "Jej, your tone was really interesting and cool. Beth, the same thing, actually. Both of your voices don't sound like I've heard the song before, but you both really sounded great doing it." Adam Levine: "The unison they did as maybe the best I've ever heard, amazing to your is melt together," and later said that he would have chosen Jej. Kelly: "I'm so excited because you all did exactly what I asked you because you are so incredibly . talented. "That's why not only the unison parts were so in sync, but what you all did in harmony, it is note-for-note on point. It's insane how incredibly talented you both are." After her message to the two performers, Kelly end up by choosing Jej as the winner of the battle, allowing him to remain as part of the team. Here's Jej Vinson and Beth Griffin-Manley performance during the "Battles" round.